Arctic ice shelves are microbial ecosystems with a rich biodiversity. Until recently, polar ice shelves were seen as mostly abiotic glaciological features, however they are oases for life, with snow, meltwater pools and sediments providing cryohabitats for microbiota. The biological communities are composed of diverse forms of microscopic life, including cyanobacteria, heterotrophic bacteria, viruses, algae, other protists and microfauna, and occupy a variety of habitats: supraglacial meltwater lakes, englacial microhabitats within the ice and snow and planktonic environments in ice-dammed, epishelf lakes. These habitats are defined by seasonal light availability, cold temperatures and nutrient poor conditions. In the supraglacial pools, production is dominated by benthic microbial mat assemblages that have diverse stress adaptation systems and that use internal nutrient recycling and scavenging strategies. Despite short growth periods and perennial low temperatures, biomass accumulations are considerable, with a striking diversity of light-harvesting, UV-protection and other accessory pigments. The chemical characteristics such as conductivity and origin of salts are defined by the underlying ice types, and microbial mat studies from adjacent habitats show a high resilience to solute concentration during freeze-up. The structural integrity of these cryoecosystems is dependent on ice, and they are therefore vulnerable to climate change. 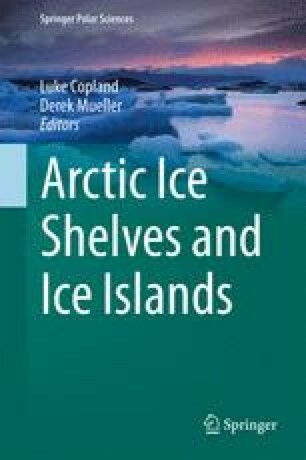 Many of these unique Arctic ecosystems have been lost by ice shelf collapse over the last two decades, and they are now on the brink of complete extinction. This work has been supported by the Natural Sciences and Engineering Research Council of Canada, the Canada Research Chair program, le Fonds québécois de la recherche sur la nature et les technologies, the Northern Scientific Training Program, and the Network of Centre of Excellence program ArcticNet, with logistics support from the Polar Continental Shelf Program and Parks Canada. We thank Dominic Hodgson and an anonymous reviewer for their insightful comments on the manuscript. Webster-Brown, J. G., Hawes, I., Jungblut, A. D., Wood, S. A., & Christenson, H. K. (2015). The effects of entombment on water chemistry and bacterial assemblages in closed cryoconite holes on Antarctic glaciers. FEMS Microbiology Ecology, 91(12). doi: 10.1093/femsec/fiv144.